Inspired by Zen philosophy and meditation, the Roshes are simplicity and elegance taken form. Without any embellishments, they feature the basic shoe necessities brought to life in every detail. Each part of the shoe reflects an aspect of a peaceful Zen garden from the modified waffle outsole that looks like stepping stones to an insole that mirrors a raked rock garden. From the Roshe One to the updated Roshe Two and the Nike Roshe Run shoe, each evolution mixes seriousness and playfulness. Experience style and simplicity by checking out the latest range of Nike Roshe shoes for women and men online at Sun & Sand Sports and have your order delivered to your doorstep in Dubai, Abu Dhabi and all across UAE. Designed by Dylan Raasch, the Nike Roshe shoes went through a series of 16 alterations on the midsole before being settling on one design. The actual inspiration for the Roshe shoes came from a Roshi Zen Master, but due to the legal nature of things, Nike had to resort to changing the name from Roshi to Roshe. The design process for the Nike Roshe Run shoes started back in 2010 when, during a Nike Sportswear Fall 11 seasonal brainstorm session, Dylan Raasch was asked to bring ideas that focused on methods of bringing value to a lower price point. The soles of the shoe were designed to mimic stepping stones that can be found in gardens. The moss and white rocks that can also be found in gardens were the inspiration for the original Iguana colourway. The idea was to keep the shoe as simple as possible by keeping only the things absolutely necessary – and as it turns out, for a running silhouette, you don’t need much. Adding quarter support, some cushioning and good heel support would generally do the trick. Apart from the details and design of the shoe, the main aim was to make it as versatile as possible. Hence why it was designed in such a way that it could be worn with or without socks. With these shoes, you can dress up or even down in it, travel, walk or run with it and chill with it, anything you want. 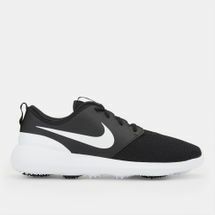 So get yourself the Nike Roshe Shoes by shopping online with Sun & Sand Sports and have these products delivered to your doorstep in Dubai, Abu Dhabi and anywhere else in UAE.